Unlike most mamba species that tend to dwell on trees the Black Mamba prefers lairs in terrestrial habitats in a range of terrains such as savannas , woodlands and in rocky slopes. They hunt during the day time by ambushing predators mainly of small mammals and small birds. With speeds of up to 11 km/h they are considered a very dangerous pursuit predator. Paired with great vision these snakes have few natural predators. When threatened the Black Mamba will open its narrow neck -flap and some time hiss at the threat . Its venom is primarily composed of potent neurotoxins that can cause fast onset of symptoms , making its venom extremely toxic. 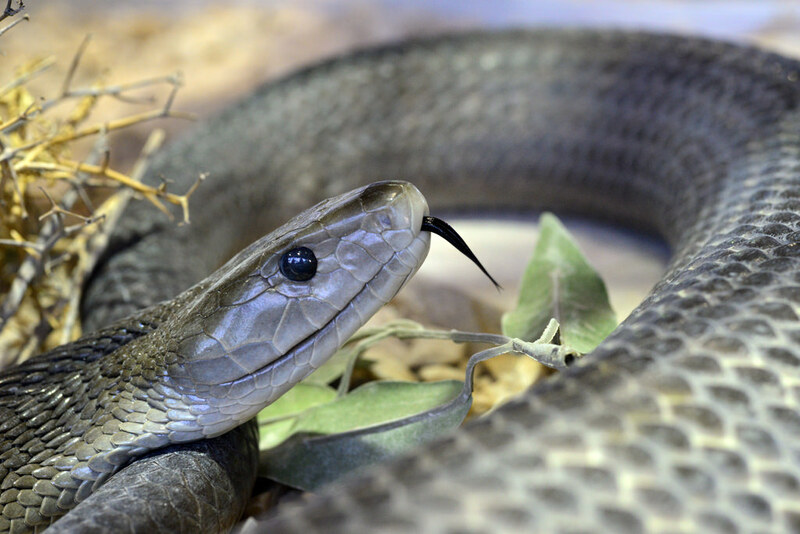 A single bite from black mamba can deliver about 110 mg of venom on average and the maximum dose recorded is over 350 mg. The Black Mamba is also the fastest land snake in the world, able to reach speeds in excess of 12 miles per hour (20kph). However it uses this speed to escape danger, rather than catch prey. If a person is bitten they will usually collapse within 45 minutes or less and without effective antivenom therapy , death typically occurs in 6-15 hours..